The protagonists of minimalism and maximalism, although taking strongly opposing views, have in common a desire to answer the question: how widespread was awareness of the Empire in British society? This question quickly leads to two more: How might this be done? And is it possible to quantify imperial awareness? The seed of a mechanism for answering these questions can be found in Porter’s book in which he lists some of the “imperial associations that mushroomed” in Britain at the end on the nineteenth century and the beginning of the twentieth. By examining a wide range of imperial groups and their memberships, I have been able to estimate the extent of imperial activism, identify the aspects of Empire activists cared about, and examine the class structure of groups’ memberships. There were about twenty-eight such imperial groups (whose membership was made up by individuals, not corporate organisations) in existence at various times in the period between 1900 and 1967. By the interwar years, their total membership had reached between one and two million. By comparison, the total membership of trade unions in that period rose from two in 1918 to three million in 1939. Thus, if one were to argue based on this numerical evidence that awareness of the Empire was of little concern to British society, should we also conclude that trade unionism was an absent-minded enterprise? One would be hard pressed to find a historian willing to take that view. The role of trade unions does, however, lead to another interesting question that can shed new light on the empire-minded British society – how did imperial awareness exist among the different classes? My research illustrates that members of imperial activist groups were drawn from all classes, although their leaders were mostly from the middle and upper classes. A notable exception to this was the Women’s Guild of Empire, founded just before the First World War, whose leaders and members were working class. 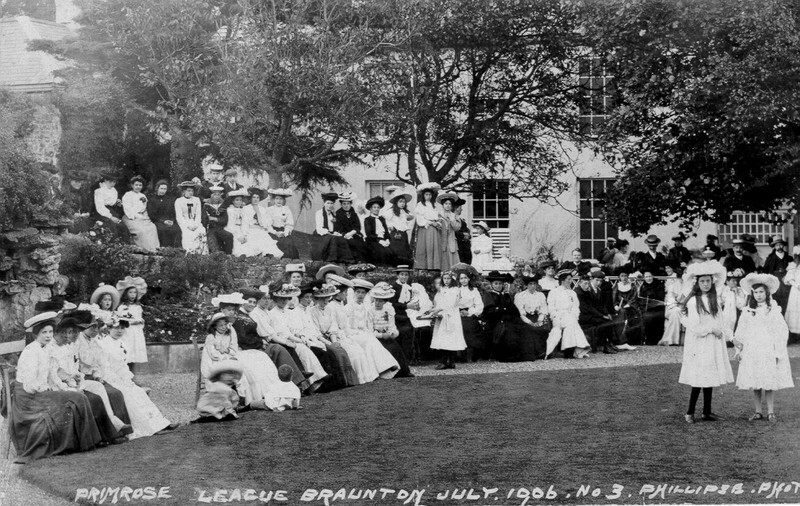 The Primrose League and the Junior Imperial League also had a significant number of working class members. 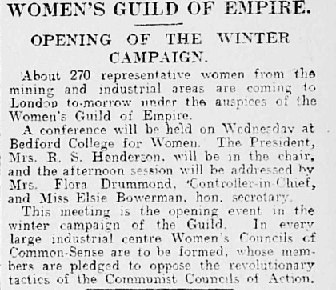 “Women’s Guild of Empire.” Financial Times, 17 Sept. 1925, 6. When examining awareness of the Empire in Britain, we also need to consider how people perceived the Empire. Which geographical parts of empire mattered most? No imperial activist group took a close interest in the Empire’s entirety. Usually, the focus was on the “white” Dominions: Australia, New Zealand, Canada and South Africa, demonstrating a strong element of feelings of “kith and kin”. Similarly, people belonging to imperial activist groups often took a specialised interest in aspects of Empire and proposed particular imperial policies. These included: increasing the integrated governance of the Empire, in pursuit of the idea of “Greater Britain”; greater integration of military resources and defence policy; imperial preference; and resisting increased self-governance of India. In other words, awareness of the Empire was not a monolithic condition. It was selective in both its geography and in its policies. Not all imperial activist groups sought to bring pressure for change – or to resist change. Some groups, such as the Victoria League and the Junior Imperial League, merely took an active interest in the Empire, wishing simply to cherish and celebrate it. We can therefore divide the era’s imperial activism into pressure groups and interest groups. The former took a “hot” interest in Empire and the latter a “banal” interest, in a way that echoes Billig’s description of forms of nationalism. Pressure groups tended to be shorter-lived than interest groups because the causes they argued for faded from the political agenda. Interest groups’ less specialised and more adaptable nature allowed them to survive longer. The peak of period for the formation of imperial activist groups was in the Edwardian era and the 1920s saw the highest number of them in operation. Active interest in the Empire noticeably began to decline from the 1930s onwards. The extent to which the Empire mattered to the British people continues to divide historians. However, any conclusions reached should be more subtle than a minimalist or maximalist view. I argue instead that a significant number of people actively cared about the Empire in diverse ways and with different levels of intensity. As a result, it becomes clear that awareness of the British Empire in Britain was neither ubiquitous nor absent-minded. Dr. Claude Scott’s PhD thesis is entitled “Caring about the British Empire: British Imperial Activist Groups, 1900-1967” (King’s College London, 2014). Bernard Porter, The Absent-Minded Imperialists. Empire, Society, and Culture in Britain (Oxford, 2006) p175. Further work needs to be done on imperial activist groups, including those whose members were corporate bodies, to establish more fully the size and class nature of their membership.